Today, DLMO is considered the best test available, a “gold standard”, for measuring Melatonin levels and Circadian Rhythm Disorders. Therefore, taking the DLMO test is very helpful for discovering and understanding disturbances in the human biological clock. DLMO is useful for determining whether an individual is entrained (synchronized) to a 24-h light/dark cycle or is in a free-running state. DLMO is also useful for assessing phase delays or advances of rhythms in entrained individuals. DLMO marker is also useful for identifying optimal application times for therapies such as bright light or external melatonin treatment. DLMO test usually takes place between 8pm and 3am. During the test patients are asked to stay in dim lighting and every hour samples of saliva, in the form of chewed on cotton balls, are collected. Afterwards, the melatonin concentration of the samples is measured. The patient cannot eat or drink 30 minutes before each sample is collected. Also, permission must be sought from lab staff members before any electronic devices are used, as these devices could alter the outcome of the test. For the entire study, patients are not allowed to have orange juice, bananas or caffeinated beverages. It may be necessary to discontinue taking certain drugs a few days to two weeks before taking the test. Please consult our physicians regarding this issue as it is of important concern. Melatonin helps regulate the circadian rhythm. It is naturally synthesized from the amino acid tryptophan. 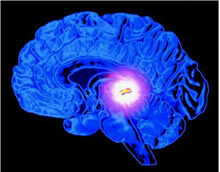 Production of melatonin by the pineal gland is under the influence of the suprachiasmatic nucleus of the hypothalamus (SCN) which receives information from the retina about the daily pattern of light and darkness. Normally, the production of melatonin is inhibited by light and permitted by darkness. For this reason melatonin has been called: the hormone of darkness. The secretion of melatonin peaks in the middle of the night and gradually falls during the second half of the night. Even low light levels can diminish melatonin production to some extent.